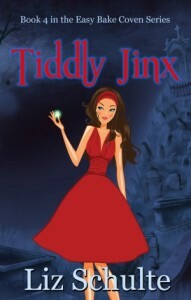 The following is a guest post by Liz Schulte, author of Tiddly Jinx. 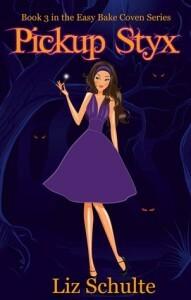 It is written from her main character’s point of view. Hello, my lovelies. This is Kat here. 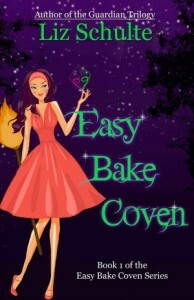 In case you don’t know me (news flash I am amazeballs you should totally know me) I am Selene’s right hand witch in the Easy Bake Coven series. Liz (she’s the author who totally chronicles our shenanigans—see told you I was amazeballs) asked if I would write something about resolutions because I already made mine back in October. Say what?!?!? 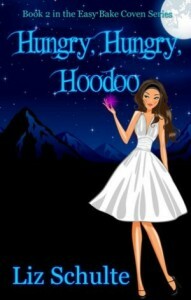 You see, witches end their year with Samhain. It takes place on October 31 (Halloween!!) and it basically marks the end of the harvest and the beginning of the darker half of the year—and colder, am I right?). Any who, that’s when I made my resolution to step out of Selene’s shadow a bit more and embrace the limelight. There was this whole thing with a Halloween party, some spells, and a total hottie dressed as Jack the Ripper, but that’s not what I am here to talk about. A new year is really a fresh start on anything you want. For me, it was redefining who I am, not that declaring it will make it so. It will take lots of hard work and plenty of setbacks—I may never get to where I want to be— but the important thing is I am trying. I mean, it’s easy enough not to try and to sit back and be like “Oh well, this is my life. I will forever be the funny one-liner to my friend’s adventures.” Or I can go out and find my own adventures. So that’s what I decided to do. Honestly, shouldn’t we all resolve to do something awesome this year instead of once again focusing on our weight like it’s the only thing that defines us? Find an adventure for this year. Go somewhere you haven’t been, learn something new, or even make a new recipe every week. Too often, we get caught up with denying ourselves things for the New Year. What’s that all about? A new year should be about bringing something new into our lives, in my opinion. I challenge all of you to think about something you have always wanted to do, but never did it. If it’s possible (like riding a unicorn probably isn’t and you shouldn’t mention it to them. I hear they’re really sensitive about being used for transportation), take steps toward making it happen. Our lives aren’t infinite. Use each day. Declare 2015 the year of Kat. So mote it be! P.S. If you want to check out any of the books I am in, the links are below. And “Ghosts in the Graveyard” in the Covens and Cocktails anthology is all about me. About the author and her work: Liz Schulte’s Bat Country. Many authors claim to have known their calling from a young age. Liz Schulte, however, didn't always want to be an author. In fact, she had no clue. Liz wanted to be a veterinarian, then she wanted to be a lawyer, then she wanted to be a criminal profiler. In a valiant effort to keep from becoming Walter Mitty, Liz put pen to paper and began writing her first novel. It was at that moment she realized this is what she was meant to do. As a scribe, she could be all of those things and so much more. When Liz isn’t writing or on social networks she is inflicting movie quotes and trivia on people, reading, traveling, and hanging out with friends and family. Liz is a Midwest girl through and through, though she would be perfectly happy never having to shovel her driveway again. She has a love for all things spooky, supernatural, and snarky. Her favorite authors range from Edgar Allen Poe to Joseph Heller to Jane Austen to Jim Butcher and everything in between.